Demo is available for Windows and for OS X.
Goblin Menace DLC is now part of Complete Story which also includes Dwarven Caverns level. 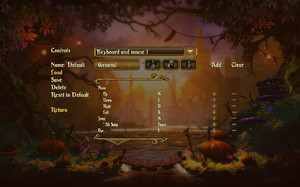 With Steam previous owners of Goblin Menace DLC are automatically updated to Complete Story. 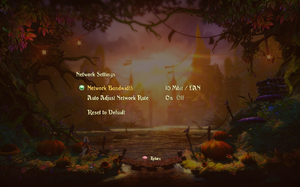 Choose from refresh rate list in launcher. Tied to the graphics detail level. To set manually see Anisotropic filtering (AF). Enforces FXAA with launcher. See Anti-aliasing (AA). setOption(renderingModule, "Windowed", false) to true. setOption(renderingModule, "MaximizeWindow", false) to true. 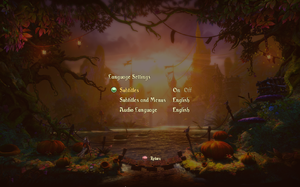 setOption(renderingModule, "WindowTitleBar", true) to false. Change setOption(renderingModule, "Anisotropy", X) to the desired value. Game does feature SSAA, but enforces FXAA on top of it. FXAA is known to blur image so some users may want to disable it. Locate setOption(renderingModule, "PostProcessAntiAliasing", true) and change to false. Locate setOption(renderingModule, "AntiAliasSamples", 0) and change to desired SSAA value. 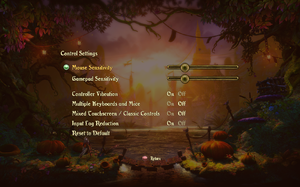 By default Trine 2 limits the frame rate to 100. Locate setOption(gameBaseApplicationModule, "FPSCapEnabled", true) and change to false. 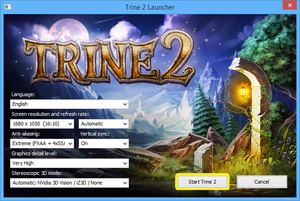 In the Trine 2 launcher, it may be necessary to change the refresh rate from "Automatic" to the actual number in hertz (windowed also works). Locate setOption(renderingModule, "ShowGlow", true) and change to false. Supports multiple keyboards and mouses for multiplayer. Possible to save and load profiles. Possible to save and load profiles. 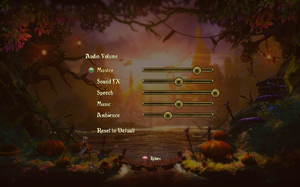 Master, effects, speech, music and ambience. Copy SpecialK32.dll to the installation folder. Run the game and exit. Edit d3d9.ini in the installation folder. Only basic game. 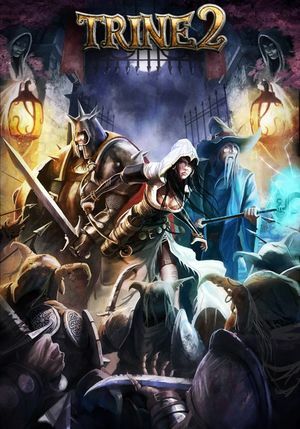 DLC content in English. 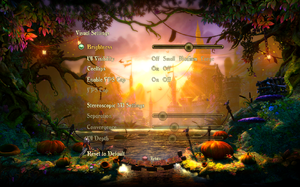 Stereoscopic 3D modes in launcher. 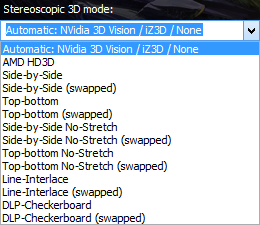 AMD HD3D, SBS (swapped, no-stretch), Top-Bottom (swapped, no-stretch), Line interlace (swapped) and Checkboard (swapped). This page was last edited on 12 March 2019, at 03:02.